Itemiw-jhse-57 - Biography of Hy S. Baltzan. Itemiw-jhse-58 - Negev Testimonial Dinner. Itemiw-jhse-59 - Memorable men and women in the Edmonton Jewish Community. Itemiw-jhse-60 - Dedication of the Edmonton Talmud Torah. Itemiw-jhse-61 - Programme of Talmud Torah Testimonial Dinner. 3 cm of textual records. -- 27 photographs. -- 1 audio cassette. Hy Baltzan was born in Edmonton in 1913. 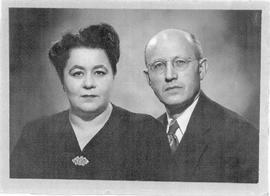 His mother and father, Mr. & Mrs. Jacob Baltzan were early pioneer leaders of the Jewish community in the city. Through his activities in various Jewish organizations, Hy Baltzan would become one of the most prominent members of the Edmonton Jewish community. Hy Baltzan was president of B'nai Brith Lodge 732 and the Jewish Community Council, national and regional vice-president of the Canadian Jewish Congress, Founding president of the Jewish Senior Citizen's Drop-in Centre, chairman of the Community Council Archives, and served on the executive of several other community organizations. Hy Baltzan was Negev Dinner honouree in 1976. 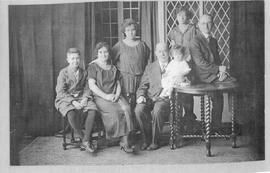 Hy Baltzan and his wife Celia had three daughters, Mrs. Jaclyn Schulman, Mrs. Gail Schloss, and Nina Baltzan. The fonds consists of materials created by the Baltzan family of Edmonton from 1897- 1999. The fonds consists of these series: 1. Jacob Baltzan (1897 -- 1996) The series includes correspondence, photographs, a monograph entitled, "Memoirs of a Pioneer Farmer in Western Canada", a copy of "Our House in Leova," in Yiddish and partial English translation, and other materials created by or related to Mr. Baltzan. 2. Hy Baltzan (191-? -- 1999) The series consists of correspondence, oral histories, photographs, newspaper clippings, booklets, and other materials created by or relating to Hy Baltzan. Donated by members of the Baltzan family in 1999 and 2002. The majority of the material is in English. Some material is written in Hebrew, Yiddish and French.